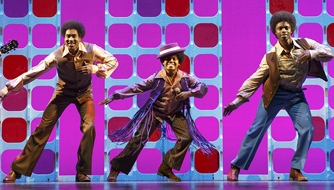 "Motown-The Musical" is a musical worth seeing at the Bushnell. It is hard to condense the play takes "The Sound of Young America" and meshes it into a 2 1/2 hour musical extravaganza with a complex storyline. It is especially exciting to see the transformation of the cast into the era's superstars. Great melody lines, lush harmonies, soulful dance moves, and elegantly radiant costuming combine to make for good entertainment. "Motown" strikes a nice balance between the rise of Motown brainchild Berry Gordy's (Chester Gregory) story and the music of the artists who turn the stage into Hitsville U.S.A. An invigorating battle of the bands ensues between the cover-groups Temptations and Four Tops with pure fun. Conductor Harold Archibald and the Motown Symphony Orchestra add ethereal qualities to the Motown catalog including the joyous "Dancing In The Street." Humorous dialogue between Smokey Robinson (Jesse Nager) and Gordy make light fun. Gordy has a special relationship with Diana Ross (Allison Semmes) in which he grooms her style from early Supremes to a blossomed 70's solo artist and movie star. The singer's powerful "Stop, In the Name of Love" is a winner. Ed Sullivan (Doug Storm) makes an unforgettably comic scene-stealer entrance and exit. Act I closes with the funky Edwin Starr rouser "War." The Temptations enter the stage and treat their audience with "Ball of Confusion" with elaborate scenes from the late 60's in projection on a screen behind the dance. A scene change to the West Coast Hollywood Palace brings forth the sophisticated Supremes' sound of "The Happening." Wonder child Michael Jackson (Leon Outlaw, Jr.) with the Jackson 5 revolutionize the Motown sound in dancing stride to "I Want You Back" and "A.B.C." Incidentally, Outlaw also portrays Stevie Wonder on "Signed, Sealed, Delivered." Wow, what a dancer! Berry Gordy's Big Soul dance party continues with the varied hits "Brick House" and "What's Going On?" with smooth Marvin Gaye (Jarran Muse) dance moves. Rick James (Nashad Naylor) even makes an appearance with "Give It To Me, Baby." Fantastic... check out the all-star finale with a Motown 25th Anniversary celebration surprise. The early music movement has taken its share of criticism for performance practice guidelines for pre-symphonic music. When these performance standards are honored, however, the listener is offered a magical transparency and clarity. Acronym, a “Baroque string band” and its talented guest soloists, presented just that kind of listening experience in its March 19th program. There was variety, ensemble tightness, and an overall joyful acoustic experience. Individual artists could be heard but without disruption of texture. There was a fresh vitality in all the playing and an especially sensitive continuo section. James Austin Smith’s oboe sound was lush; Dave Shuford’s harpsichord solo was rapturous. The amiable and learned Yehuda Hanani (the series director) began the evening with verbal program notes both entertaining and educational. He later performed as a solo cellist. The violins were featured in the first part of the program (there were a few intonation problems on the C Minor Fugue. Shuford’s harpsichord solo was rapturous; the first half ended with the double concerto for oboe and violin. The sound was lush and assertive from both soloists and the oboe provided a nice contrast to the bow and plectra. There was a short but humorous nod to the fictitious P.D.Q. Bach after intermission before the romantic performance of a modern “Baroque” concerto by Henri Casadesus, performed by Hanani. In his encore Andante by J.S. Bach (transcribed for cello), he and the ensemble continued to show their mutual support and admiration. It was later revealed from the stage that Hanani has been the cello teacher for Acronym’s own cellist, Kivie Cahn-Lipman, since the age of five. The evening ended with the familiar Brandenburg Concerto No. 3 and the audience was dazzled all over again by virtuoso string playing from these young and talented instrumentalists. The “Close Encounters” series includes an eclectic mix of performers, genres, and themes; these concerts make a delightful roster in the fine acoustics of the Mahaiwe, the gem of the Berkshires’ venues. The South Hadley Chorale was founded in 1984 to perform Bach’s Mass in B Minor during the composer’s tricentennial year, 1985. Its Music Director for the past six years is Jonathan Harvey, who conducted three of the four works on the program. Its 70+ sopranos, altos, tenors, and basses are from South Hadley and 17 surrounding communities. 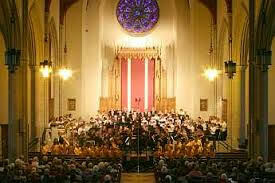 The musicians begin rehearsing in October for an annual concert in March. The concert opened with four brief selections sung by the South Hadley Children’s Chorus, founded by the Chorale in 2001 for children ages 7 -14. Their performances of Faure’s “Tantum Ergo” and “Pie Jesu” from his Requiem and Copland’s settings of “Simple Gifts” and “I Bought Me a Cat” were spirited and endearing, as conducted by their director H. David Pulliam and accompanied by pianist Michael Carney. The Children’s Chorus then joined the Chorale in a radiant account of Faure’s lovely “Cantique de Jean Racine.” The Chorale here demonstrated the same careful intonation and clear enunciation that they maintained throughout the program. They were beautifully accompanied in all four pieces by a 14-member chamber orchestra of mostly string instruments. The acoustics of Mount Holyoke College’s Abbey Chapel added just enough resonant glow to the sound for voices and orchestra to be heard in balance with each other. A vibrant rendition of Corigliano’s “Fern Hill” that featured the crystalline mezzo-soprano of Mary Brown Bonacci, conveyed all the youthful enthusiasm of the exuberant yet wistful text. A dignified account of the 18-year-old Schubert’s Mass in G Major, led by Carney, the Chorale’s Associate Conductor, showcased the supple voices of soloists soprano Mary Hubbell, tenor Spencer Hamlin, and baritone Ryan F. Burns. A dramatic performance of Vaughan Williams’ cantata “In Windsor Forest,” based on Shakespeare’s “The Merry Wives of Windsor,” drew sharply characterized vocal acting from Hubbell and various sections of the Chorale in a drinking song, a fairy dance, and a wedding procession. An impressively full house and a joyous post-concert reception highlighted the Chorale’s large following, which discerning lovers of choral music throughout the Valley would do well to join. The two “Russian masters” whose music was played on this “Masterworks Series” program were Prokofiev and Tchaikovsky. HSO Music Director Carolyn Kuan had the canny programming idea to surround Tchaikovsky’s beloved Violin Concerto with the two most acclaimed of Prokofiev’s seven symphonies, which are still much less familiar than the Tchaikovsky Concerto to the average concertgoer. The concert opened with Prokofiev’s first symphony, which he called the “Classical” to reflect his goal of writing a modern symphony in the style of Haydn, who founded the symphony as a classical form in the late eighteenth century. Except for some spiky 20th century harmonies (it dates from 1917), it could have been written a century earlier. A reduced-size HSO gave the four short movements (totaling 15 minutes) a lithe and buoyant performance. 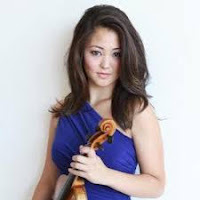 The evening’s star was 18-year-old violinist Simone Porter, who gave a dazzling account of Tchaikovsky’s concerto. Her youth and modest physique belied the power, maturity, and technical finesse of her playing. She tore into the faster rhythms of the opening Allegro and the finale’s Cossack-style dance with full-bodied passion, but brought a hushed delicacy to the haunting slow movement melody that famously made Leo Tolstoy cry on first hearing it. The orchestra was with her all the way under Kuan’s watchful leadership, which kept the many passages of dialogue between soloist and ensemble in clear balance. But for emotional intensity and sonic splendor, the commanding account of Prokofiev’s fifth symphony that followed intermission was the evening’s musical highlight. Written at the height of World War II as a celebration of the human spirit, it featured the program’s largest and most colorful orchestra. From the huge climax of the opening Andante, through the fleet, motoric scherzo, the dark, brooding Adagio, to the exuberant Finale, the playing was forceful and riveting. The musical bond between conductor and ensemble seems only to have been strengthened by the recent resolution of the HSO’s labor dispute, to the evident satisfaction not only of the large audience in the Bushnell’s Belding Theater, but of the Maestra herself, who personally thanked patrons for their support as they left the hall. In his invaluable “Rhodes’ Reflections” column in the program book, SSO Music Director Kevin Rhodes noted that “what unites this evening’s compositions [is] their differing connections to the ‘spiritual.’” The first was “The Last Sleep of the Virgin,” an orchestral interlude from Massenet’s 1878 oratorio “The Virgin” which, in Rhodes’ words, “depicts the Apostle Thomas coming to the tomb of Mary to say his last farewell.” The SSO’s performance was hushed and reverent. The easy flow of Biegel’s virtuosic playing expressed both his obvious affection for the 21-minute piece and the importance of music in his life, after a piano stimulated his recovery of hearing and speech at age three. All sections of the orchestra also reveled in the score’s many opportunities for bright and subtle instrumental colors. Two familiar ballet suites completed the program after intermission. Copland’s “Appalachian Spring” includes preparations for a wedding and quotes the Shaker hymn, “Simple Gifts.” The passionate account by Rhodes and the SSO reinforced how pivotal this music written for modern dance pioneer Martha Graham in 1944 was in defining the open harmonies of Copland’s distinctively American sound. Based on several Russian folk tales involving magic and the spirit world, Stravinsky’s “Firebird” was his breakthrough piece, the first of several ballets he would write for Serge Diaghilev’s Paris-based Ballets Russes. The full-bodied rendition by orchestra and conductor, from the mysterious, dark opening to the triumphant climax, again evoked how original this music must have sounded at its world premiere. An appearance several days earlier at Bay Path University by Fuchs, Biegel, and Rhodes is exactly the kind of community outreach that many classical ensembles should be doing. 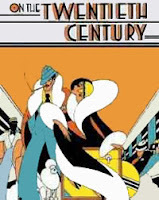 The original Broadway production of “On the Twentieth Century” won five Tony awards in 1978, including best leading actor in a musical, best featured actor in a musical, and best scenic design. David Leslie’s star turn as down-on-his-luck impresario Oscar Jaffe, Gaven Mackie’s priceless boy toy Bruce Granit, and imaginative set design by Josiah Durham and Mark Giza deserve similar awards for their work in TGH’s entertaining production of this over-the-top musical. Tonys also went to composer Cy Coleman and lyricists Betty Comden and Adolph Green for best score and to Comden and Green for best book of a musical. Coleman’s inventive fusion of classical operetta with 1930s hot jazz is played with affection and aplomb by the five-piece band strongly led by music director Elisabeth Weber. 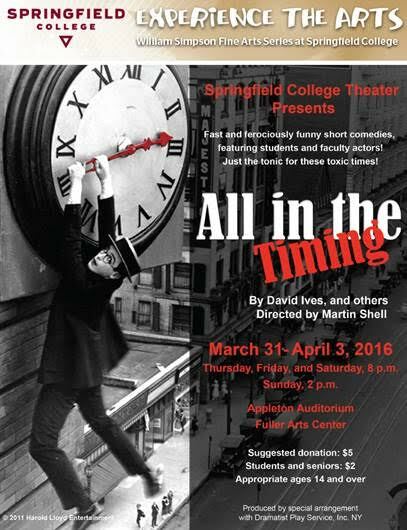 The sharp wit of his partners’ dialogue and lyrics is delivered with fresh enthusiasm by the entire 27-member cast. Ally Reardon brings glamorous presence and a lovely singing voice to leading lady Lily Garland, whom Oscar had molded from klutzy piano accompanist Mildred Plotka into a movie star, whom he hopes to lure back to the stage for her “role of a lifetime” as Mary Magdalene. Kevin Wherry and Brad Shepard strike just the right notes of comic exasperation as Oscar’s hapless henchmen in this quest to restore their lost finances. As ditsy religious zealot Letitia Peabody Primrose, Kathy Renaud is a hoot, who steals the show every time she comes on stage. Her big first-act number, “Repent,” is the musical highlight of the evening. Devon Bakum is equally hilarious in two smaller roles as an aspiring but hopeless singer and as the doctor on board during the “Twentieth Century” train’s 16-hour trip, where the plot unfolds, from Chicago to New York. Special kudos must go to Jared Buteau, Jon Todd, Ian Weber, and Ted Welsh as the four tap-dancing porters who regularly interrupt the action and memorably remind the audience in their own big musical number that “Life Is Like a Train,” to choreographer Kathleen Delaney for her delightfully zany work, and to director Giza for his firm but loving hand. Don’t be confused – the Majestic’s play is “Butler,” not “The Butler” or about a butler. Changing the title would be the sole, significant suggestion to improve this masterfully written and produced slice of history conveyed through the artistic format of a play. Set at the cusp of the Civil War, is a little known yet exceedingly important true story of three slaves’ escape to the Union’s Fort Monroe, Virginia. Paramount in “Butler” is the crisp, almost choreographed, dialog primarily between the slave Shepard Mallory and General Butler. The sometimes staccato rhythm of clever words bantering between the characters creates an unintended kinship – the two are much alike in their disparate circumstances. While important to the audience who wants to realize Mallory’s outcome, this portion of the plot is secondary to the rapport between this atypical prisoner (he wants to be caught) and brand new officer (figuring out his job, on the job). Director Joseph Discher, a first-timer at the Majestic, should be asked to return. This is a man who, in essence, paints a picture, with close attention to each character’s nuance, both visually and vocally. Silliman (Butler) and John G. Williams (Mallory), are visitors who, like their director, are encouraged to come back. Silliman brings Butler to life with his first lines – brisk, loud, and formal. He is a big man who portrays arrogant and nervous, bombastic and gentle simultaneously. Silliman is more than up to the task. In contrast, Williams (Mallory) is slight, soft-spoken, brash, and witty. Silliman and Williams play astute and intelligent people who don’t want to like each other. Lanky and lean, Tom Dahl (Lieutenant) looks the dichotomy of his boss, the General. Dahl, as the actor given the most humorous lines, throws his body stance and wide eyes into the role as a by-the-book soldier with a soft edge. In his short time onstage, David Sitler (a Confederate officer) quickly establishes himself as a foolish windbag. Entering the theatre, the audience “walks into” Greg Trochlil’s single set, the General’s office of brick, stone, wood, arched windows, and gaslights. Boasting a talented cast, astute direction, and period staging, “Butler” should not be missed.